Jackson Pollock was at the wheel of his 1950 Oldsmobile when it ran off the road in 1956, killing himself and one of the other two occupants. It was devastating. His tragic-heroic life cut short when he had more masterpieces left inside him. His troubled life unfolded against the backdrop of two World Wars with the Depression in-between. Pollock studied with Thomas Hart Benton and when they both worked for the Works Progress Administration, creating murals for public buildings, he had this experience to draw on when creating paintings of immense scale — that mysterious and ambiguous quality — that would have a profound emotional effect on the spectator as well. Pollock took leave of the easel and worked on the floor, where he could walk around his work while painting it. Perhaps this method was akin to the Indian sand painters of the West, for whom he had a kinship. Although born in Cody, Wyoming, in November 1912, Pollock’s mother took her five sons to San Diego when Jackson was just 10 months old and would never return to Cody. He subsequently grew up in Arizona and Chico, CA. He explored Native American culture while on surveying trips with his father. In an excerpt from Out of This Century, Peggy Guggenheim said, “ When I first exhibited Pollock, he was very much under the influence of the Surrealists and of Picasso. But he very soon overcame this influence, to become, strangely enough, the greatest painter since Picasso.” She also said she felt Pollock had a deep feeling for West American-Indian sculpture, as it came out a lot in his earlier paintings. 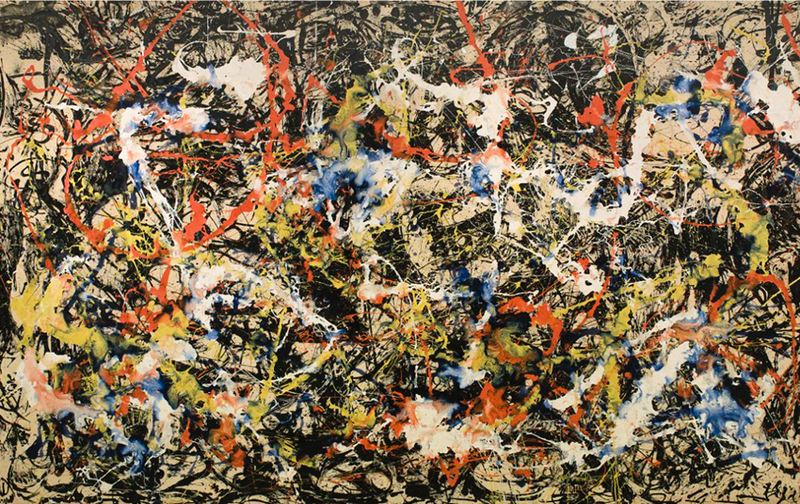 At his revolutionary core, Pollock believed a work could be initiated without idea or subject by a simple act of will—the will to make a painting. Any gesture with paint or crayon was sufficient to set up a situation that would then engage the artists’s latent impulses. Once reciprocating action had begun between the art and the canvas, an image laden with meaning for both the painter and his public would be brought into being.